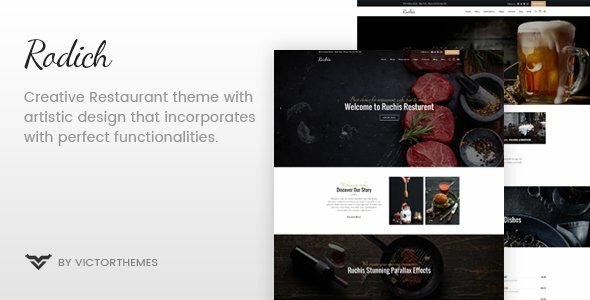 Rodich is an awesome restaurant theme comes with classy design and powerful functionalities which has specifications that best suited for food industry and gives remarkable browsing experience to your customers with convenient and beautiful look. Rodich is responsive, each and every element are fully responsive. Weather you’re looking at mobile tablet and desktop devices. The lady met this fellows and they your life speed. Pixely crafted unique menu pages allows you to present your recipes better than your competitors. Smashing restaurant template with stunning animation effects makes your website more attractive and unique. Stunning and delightful restaurant theme has a solid foundation with WooCommerce that bring value to your business. Uniquely showing your food blogs are crucial, so we focussed on creating up-to-date stunning blogs for you. Rodich is 100% perfect and device friendly theme, each and every element are carefully created to adapt and work comfortable with any device. Lively and vibrant pages that brings you a elegant design feel with perfect user interaction & experience. Rodich theme is well organized in color section. You can change each part colors from live preview at Customizer. So, you can see that changes on the fly. Rodich is comfortable with Contact Form 7 plugin. We’ve followed contact form 7 native way strictly, so you’ll never loss of it’s simplicity with powerful options. WooCommerce is a powerful and extendable eCommerce plugin that helps you sell anything Beautifully, Rodich theme is comfortable with Woocommerce plugin. Rodich theme perfectly supports search engines algorithms. SEO is most important part to run a successful business. Organic searches only stays as lifetime. Rodich theme has advanced typography settings available at theme options panel. You can customize font weights, line heights and what ever you want to add CSS propertise easily. By using a child theme you will ensure that your modifications are preserved. Child themes are the recommended way of modifying an existing theme. Rodich already packed with child theme! Rodich theme will ensure that, your every visitors receives the same experience across all browsers. We stickly support browser compatibility with cross OS platforms & devices. Purchasing a Premium theme, one the cons for all time is updating process. It’s hard to update each time. Rodich theme fix your hardest part. Now you can get updates with your WP Panel.